The Ardentinny is a contemporary Scottish bar & Italian bistro. In the heart of the picturesque village of… you guessed it: Ardentinny. Nestled on the shore of Loch Long, it boasts an impressive view from the outside decking, with modern décor and traditional community values on the inside. We’re wheelchair accessible and welcoming to well-behaved dogs. We have a large car-park out front, the buses stop right outside the door, and we’ll soon have permanent moorings set up for easier access from the loch out back. If you drop in of a weekend evening, you might find some locals enjoying a traditional music session and a sing-around, or a group of tourists enjoying a cocktail party. Swing by on a weeknight and you may even be lucky enough to nab a seat by the wood-fire. We serve a range of fine wines and whiskies, as well as a selection of lager and ales. Our restaurant offers contemporary mains, pub classics and authentic Italian pasta and pizza. And lets not forget the desserts! Our cake tray is always resplendent, and if you fancy something more indulgent, the cheesecake is to die for. Mon: 12.00 – 15.00 & 17.00 til late. Wed: 12.00 – 15.00 & 17.00 til late. Thurs: 12.00 – 15.00 & 17.00 til late. Fri: 12.00 – 15.00 & 17.00 til late. 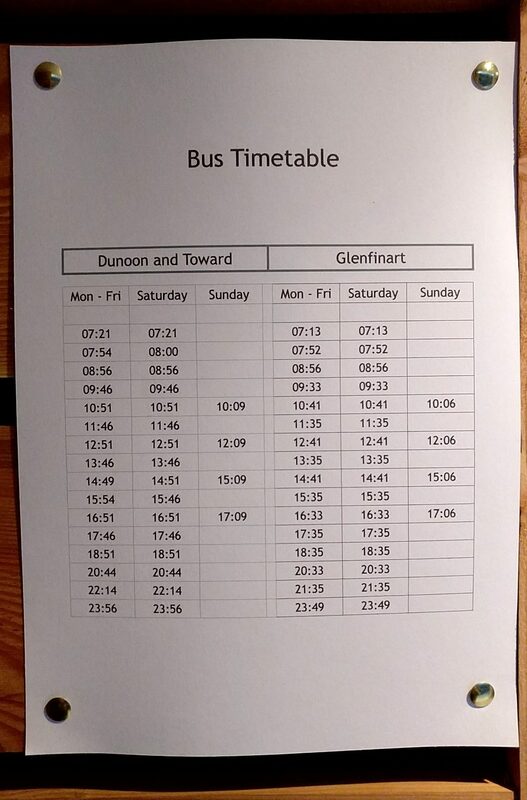 You can catch the 489 bus from the ferry terminal at Dunoon, travelling towards Glenfinart, and it will drop you at our door in Ardentinny. The 489 bus runs roughly once an hour. Meaning you can be dropped off at 12.40 – in time for opening – and catch the last bus back to Dunoon at 23.56 if you wish! If you’re joining us for Sunday lunch, just be aware that the last bus back to Dunoon is at 17.09. 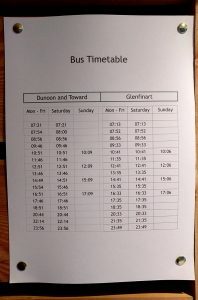 We’re the penultimate stop on the route, so a good trick is to keep an eye out for the bus heading past on it’s way to Glenfinart and start finishing your drinks! Above is an outline of the summer timetable, which you can click to enlarge, or better yet, click over to West Coast Motors to get the most recent schedule. The Ardentinny Bar & Bistro stands on a rocky outcrop on the west shore of Loch Long and occupies the site where signal-fires were used to summon the ferry from Coulport on the east shore. The site has a rich history, with parts of the building dating back to the late 1600’s, originally serving as a place where the Dukes of Argyll waited for the ferry whilst travelling between castles in Dunoon and Rosneath. Our West Highland weather no doubt provided ample reason to build a structure to wait in, and this later became an inn for cattle drovers catching the ferry to markets on the mainland (their cattle would swim alongside the ferry, and this route was likely chosen so they didn’t have to swim too far!). In the late 18th Century it then came to serve as a coaching inn. When the ferry route closed in the 1800’s, The Ardentinny Inn became a hostelry for travellers making the long journey around the top of Loch Long by road. In modern times, the building was known as the Ardentinny Hotel. It was popular with tourists seeking the pleasures of a beautiful village with access to Loch Lomond and the Highlands, as well as with yachting and touring groups. Incidentally, the name ‘Ardentinny’ means ‘Point of Fire’ and this is thought to refer to warning fires – lit to aid mariners coming up the loch from the Firth of Clyde – dating back even earlier than the signal fires for the ferry. More recently however, the Ardentinny Hotel was struck by lightning and the roof was set alight. No ferry was summoned that night, but we feel that the village has definitely earned it’s name through the centuries! As of July 2017, The Ardentinny is now a contemporary bar & bistro, proud of it’s history and with an eye on the future!